And how I learned to stop fearing and murdering houseplants. 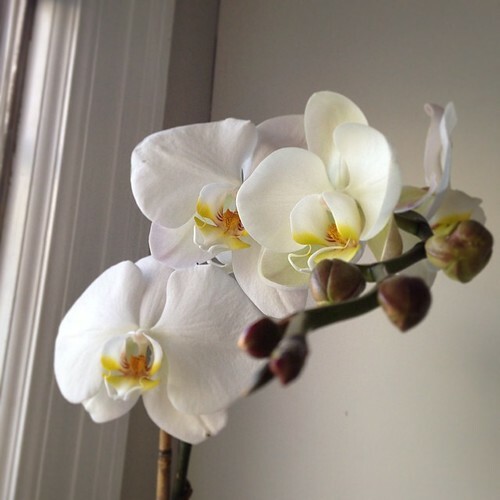 Orchid no. 4. Gift from Tara and Andrew. 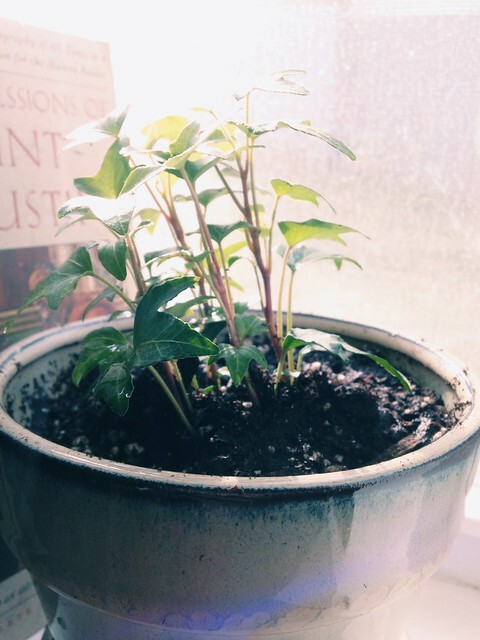 I killed — either by neglect or by over-attention — every houseplant I had in the first two years of our marriage. Including a spider plant that my boss gave me, with the caveat, “Not even you could kill this plant.” But I did. I was quick to term myself as a person with a brown and/or black thumb. 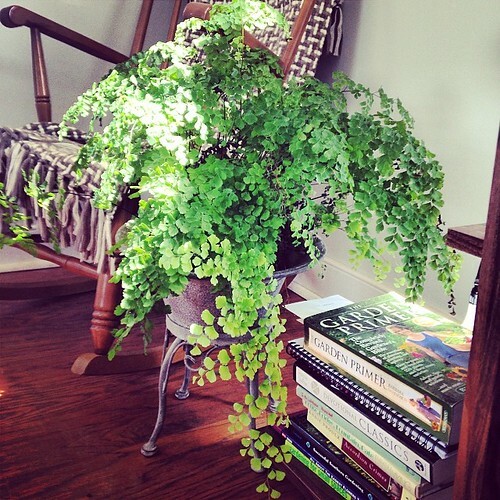 My most finicky plant: The Maidenhair. She will wilt if you even look at her funny. But then I decided I should actually start learning and caring about these living things, and so I did what I always do: Read all the books! I read every book our public library had on houseplants, and, imagine that, some extra knowledge helped. I am killing far fewer, and I daresay some plants are even thriving under my amateurish attentions. My plant obsession continues to nearly untenable levels. 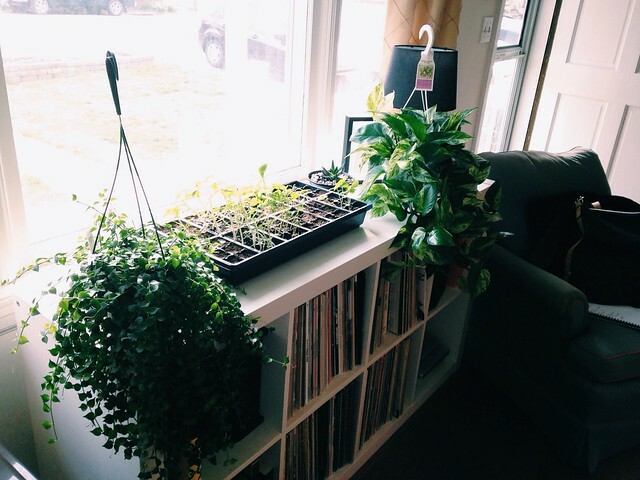 (I started a houseplant inspiration board on Pinterest. Yes. Oh, my, yes.) Thankfully, some of the plant fever is spreading outdoors. Guion takes care of the practical plants (e.g., vegetables, herbs, hops, fruit trees), and I have taken charge of the ornamental plants (landscaping the front yard, choosing plants). It is a good system. Get to know the conditions of your home. 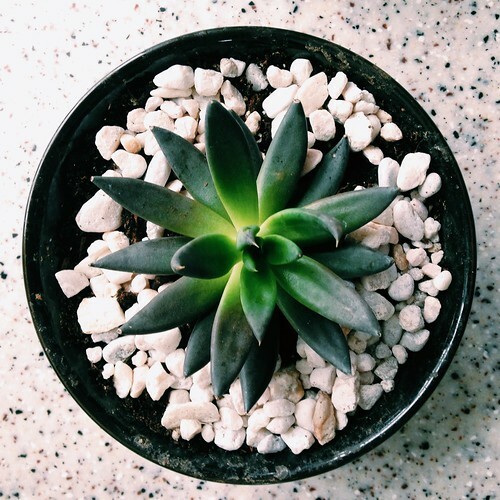 If you have a very dry home, look for arid-loving plants, e.g., succulents. If you have a humid home, look for ferns and tropical plants. If you’re somewhere in between, like most of us, find those versatile, hard-to-kill specimens that seem to thrive anywhere. Learn about light. 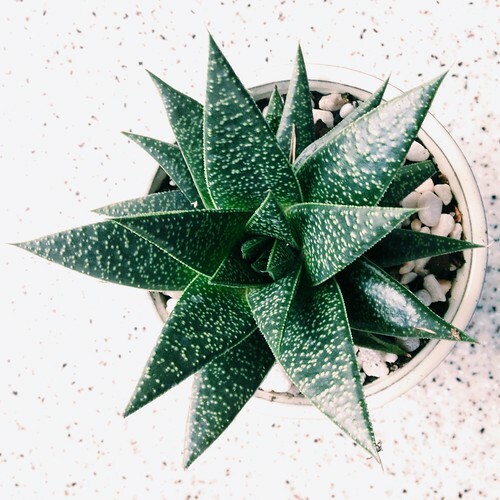 Plants want light in various forms; get to know your plant and what it likes, and get to know your home and what kind of light it offers throughout the day. Plants die for two reasons, generally: (1) too much or too little light, or (2) too much or too little water. If your plant looks sad, it is probably a light or water situation, or both. Stay on a schedule. I water (almost) all of my plants on Sunday morning. This, more than anything else, has kept me from killing. Without a consistent watering schedule, I am liable to forget when I watered last, and either overcompensate with water or let the plant dry out and suffer from neglect. 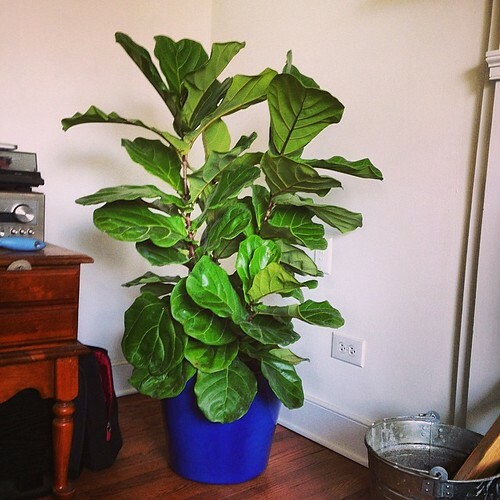 Jumped on the fiddle leaf fig bandwagon. 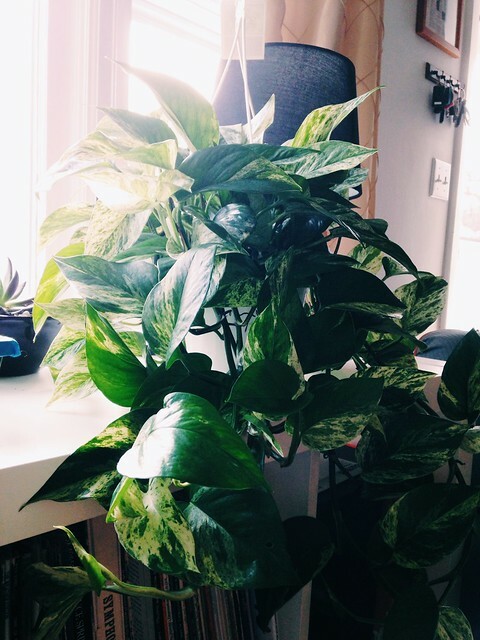 Pothos, to be hung in our bedroom. 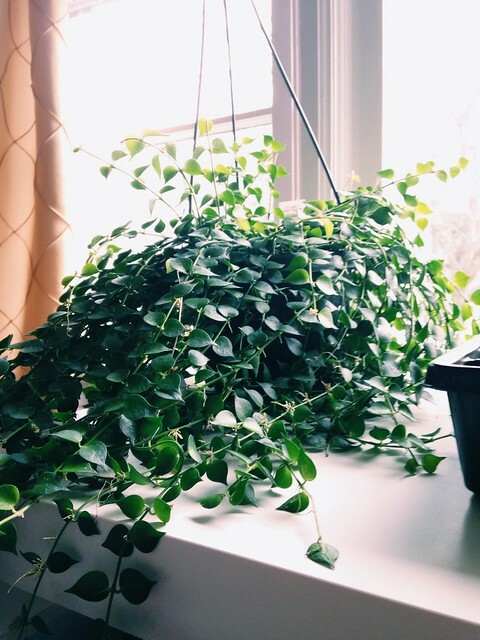 Million hearts plant, to be hung in the living room. 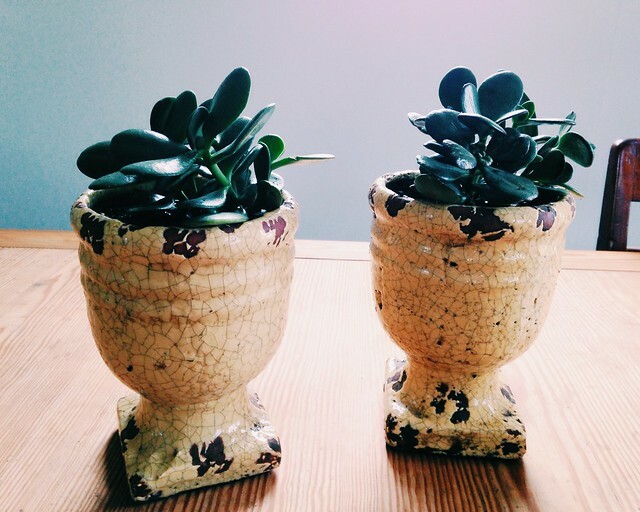 Two jade plants for the kitchen table. Succulent for the living room. English ivy in a basement window. 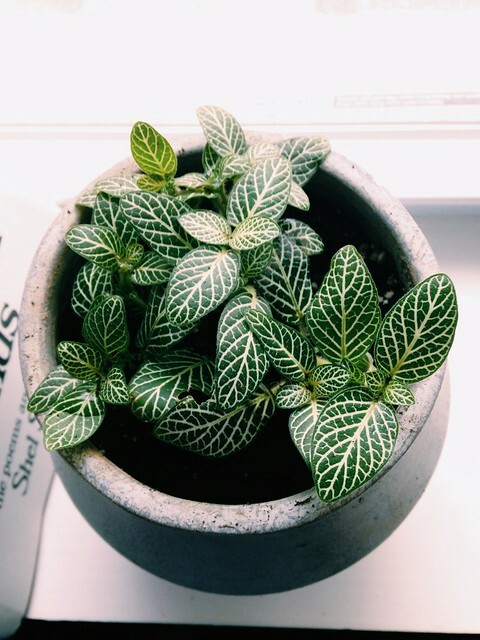 Fittonia (aka nerve or mosaic plant) in windowsill. Plants to be hung, along with Guion’s seedlings. 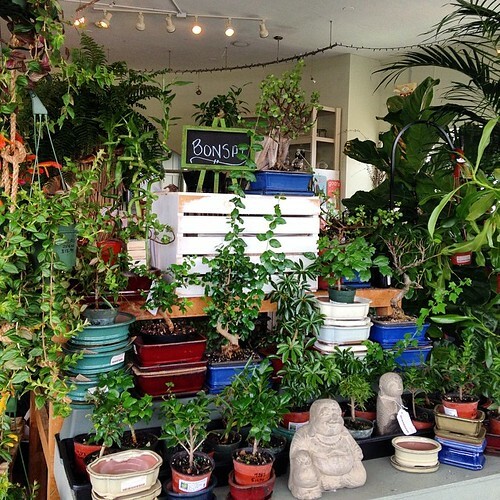 Bonsai section at Fifth Season. Heads up: I think bonsai trees are going to be my next obsession. Just wanted to declare that to the world. Oh, I love that million hearts plant. So pretty. I have zero houseplants. You’ve inspired me!